RIDE THE WILD SURF , as you may deduce, is a surfin’ flick, but unlike the other inane beach party flix of the 60s, this one is not a musical-comedy (not that the others were especially musical or comedic: even I have some limits on pining for the past) but rather a lightweight drama, easy enough to take, pleasant on the eyes. 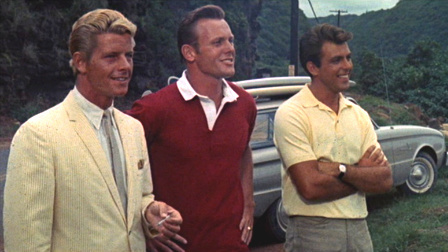 Three ‘nice’ surfers (Fabian, Peter Brown, Tab Hunter) come to Hawaii, compete against three ‘mean’ surfers (Anthony Hayes, James Mitchum, Roger Davis) and make it with three ‘cute’ beach bunnies (Shelley Fabares, Barbara Eden, Susan Hart). 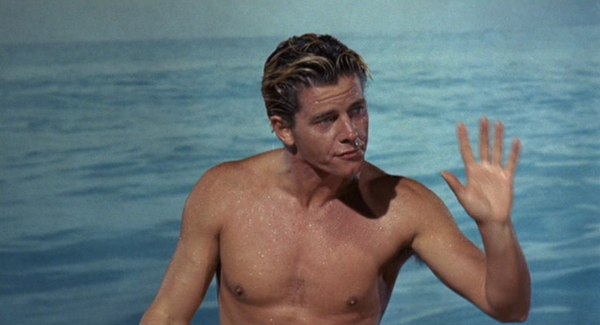 O’Neill it ain’t, but as a breezy little 1964 adventure, it’ll do, with the bad stuff as much fun as the good. What’s good? Fabian—hey,he got knocked from here to Philadelphia, but I always liked him. No threat to Burton or O’Toole, but he was more fun than the era’s other pop star actors—Frankie Avalon, Tommy Sands, to smite a few—and here he’s teamed with Fabares, finally revealing the saucy side ( would have said ‘bod’, but I don’t want to start a riot) she’d taunted so many boys with for years on The Donna Reed Show. Their romance is predictable, but digestible. Harder to swallow are Brown & Eden, who approach barf-out being cute, with Hunter & Hart giving rival gorge acting wholesome. Salting up the kandykorn are the three sandkickers, sneered across just right by Hayes, Mitchum and Davis (runner-up, Best Supporting Weasel). The location scenery is colorful, and Joseph Biroc’s camera captures some exciting waves and hot board action, along with some unintentionally hilarious back-projection shots of the stars trying to balance and smile while getting doused in the kissers with buckets of water( they were ‘riding’ Radio Flyer wagons in the studio). 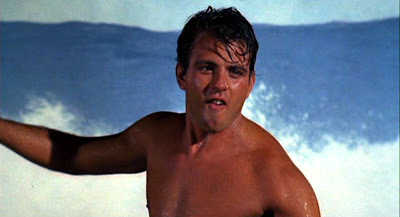 With character names like ‘Brie’, ‘Augie’, ‘Steamer’ and ‘Moose’, with Fabian using a speargun to shoot a pineapple balanced on Mitchum’s head , and with a capper of Jan & Dean’s title tune, basically an ode to the Concept of Boss, this rates as some sort of mini-classic in the bad-is-good movie gene pool. Some of the slapdash is a result of several directors. Credit goes to Don Taylor, but also pitching in were Phil Karlson and the team of Art & Jo Napoleon, who wrote the screenplay. It rode on with $3,800,000, 72nd place for the year, which also witnessed the happenings of Bikini Beach, Muscle Beach Party and Pajama Party. Runs 101 minutes.